StorePep is a cost-effective e-commerce solution that integrates with a vast array of sales channels and delivery service providers. It offers live carrier rates upon checkout and automatically chooses the most economical one. This way, you can save on shipping costs. 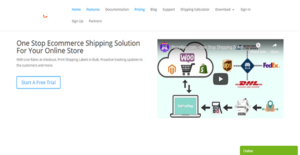 What sets StorePep apart from other solutions is that it’s the only e-commerce service that supports WooCommerce multi-vendor shipping. StorePep enables you to be proactive in tracking deliveries, too. As a result, you can build customer trust. Apart from that, the solution lets you export the tracking details so that you can change the status of orders to be completed automatically. Moreover, StorePep assigns a dedicated product manager to you. This person is to assist you from onboarding to integration as well as in any post-sales issue. Upon the customer’s checkout, StorePep generates the most up-to-date rates of your connected carriers. It then selects the most cost-effective rate to ensure that your customers push through with their orders. This not only helps you increase your sales, but this feature allows you to build stronger relationships with customers. StorePep immediately books courier pickup to ensure that orders are processed and delivered in a timely manner. Additionally, it generates manifests as well as customs documents to facilitate the swift handling of your packages. When you have multiple packages to process at one time, StorePep eases your burden by printing shipping labels in bulk. Not only does this save you time, but it also ensures that you do not miss labeling a single package. With StorePep, you know every step that your packages go through. As such, you can inform your customers of the movement of their orders at any time. Moreover, the solution draws information from the tracking details that you export back to your store. This means that it can read the statuses of orders to mark complete those that have reached their destinations. If you are interested in StorePep it may also be beneficial to analyze other subcategories of Best eCommerce Software gathered in our base of B2B software reviews. Every organization has different needs and needs a system that can be personalized for their size, kind of employees and clients, and the particular industry they are in. For these reasons, no software can proffer perfect functionality out-of-the-box. When you try to find a software product, first be sure what you require it for. Read some StorePep reviews and ask yourself do you want basic features or do you need complex features? Are there any industry-specific features that you are seeking? Obtain the answers to these queries to aid your search. There are plenty of factors that you need to mull over and these include your budget, specific business wants, your organization size, integration requirements etc. Take your time, try out a few free trials, and finally choose the app that provides all that you require to enhance your organization efficiency and productivity. How Much Does StorePep Cost? We realize that when you make a decision to buy eCommerce Software it’s important not only to see how experts evaluate it in their reviews, but also to find out if the real people and companies that buy it are actually satisfied with the product. That’s why we’ve created our behavior-based Customer Satisfaction Algorithm™ that gathers customer reviews, comments and StorePep reviews across a wide range of social media sites. The data is then presented in an easy to digest form showing how many people had positive and negative experience with StorePep. With that information at hand you should be equipped to make an informed buying decision that you won’t regret. What are StorePep pricing details? What integrations are available for StorePep? If you need more information about StorePep or you simply have a question let us know what you need and we’ll forward your request directly to the vendor.